Ban Rare Guesthouse is about 2.5km from Central Plaza in Udon Thani, and offers fairly basic air-conditioned rooms with free Wi-Fi. There is also free public parking and a restaurant. The guesthouse is 3.1km from UD Town, and 200 metres from Phosi Market. Rooms are equipped with a flat-screen cable TV and seating area, each featuring a shower, with private bathrooms that also come with free toiletries. The restaurant serves Thai dishes. 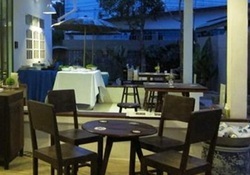 A standard double rooms costs about 600 baht per night.